Travelling to Argentina? Want to get to know the country before you go? From the nitty gritty travel details to a rundown of the country's tubulent past, what to expect in a traditional Argentine restaurant or how to get off the beaten track in Buenos Aires - you've come to the right place for all the Argentina information you could possibly want! Learn here The History of Argentina from the arrival of the Spanish conquerors to its present day society in constant transformation. 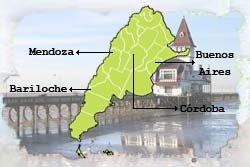 The weather of Argentina is as diverse as its scenery, which goes from the rainforest areas in the north of the country to the austral ice caps, and results in a world of exuberant landscapes. Visitors to modern day Latin America will feel like millionaires as the comparably weak Latin American economies allow our currencies to go so much further. Fresh local produce is always on the menu; with delicious Latin food accompanied by smiling faces and the relaxed daytime lifestyle is contagious to even the most hardened workaholic who pays a visit. The cinema culture of Argentina is vast and rich, and it is an important economic asset to the country, as well as a way of expressing the Argentinean idiosyncrasy. If you love sightseeing, breathtaking landscapes and a rich and lively urban life, Argentina is the right country for you! The habits and way of life of Argentina will enthral the visitor and open up a world of colour and good vibrations. 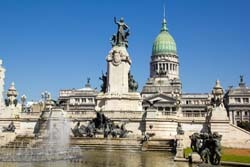 Visit Argentina and let the liveliness of its everyday life take over you! We want to present you with a comprehensive guide that includes every fact and explanation you might need on your voyage to Argentina, from before you take off to the moment you set foot on the country. With this thorough guide you will have all the basic information on sights and visits that you cannot miss, at the same time as you obtain fascinating wisdom on the habits and folklore of the Argentineans.